India is taking a gander at renewable option fuel sources to decrease its reliance on imported products of oils. As India imports 70% of the oil, the nation has been hit hard by expanding expense and instability. As of late the biomass assets are being utilized as option powers and successful utilization of those energizes is picking up unmistakable quality as a substitute approach to tackle the issue of a dangerous atmospheric deviation and energy crisis. Among all the option powers existing mahua oil is additionally one. Mahua oil is extracted from mahua seed oil. The properties of these blends were observed to be practically identical to diesel and affirming to the American standards, experiments are conducted on variable compression ratio diesel engine, which is water cooled, rated at a speed of 1500 rpm. Unique mixes of transesterified mahua oil, diethyl ether with diesel were tested at different proportions and at different compression ratios like 14:1, 16:1, 18:1 and 20:1. From the experimental results we have identified that Slight increase in brake thermal efficiency and decrease in specific fuel consumption compared to that of diesel. The expense of transesterified mahua oil is low contrasted with the expense of diesel. Henceforth, mahua oil blends with diesel is more economical. However, this is a partial solution to the growing diesel scarcity in developing nations like our own. A considerable measure of examination work has been done to utilize vegetable oil both in its slick shape and changed structure. Since India is net shipper of vegetable oils, edible oils can't be utilized for creation of biodiesel. India can possibly be a main world maker of biodiesel, as biodiesel can be reaped and sourced from non-palatable oils like Jatropha curcus, Pongamia pinnata, neem, mahua, castor, linseed, and so on. Some of these oils delivered even now are not being legitimately used. Out of these plants, we are concentrating on mahua which can develop in bone-dry and Bad Lands. Execution of biodiesel in India will prompt numerous points of interest like green spread to no man's land, backing to farming and country economy and diminishment in reliance on imported crude oil and decrease in air pollution. 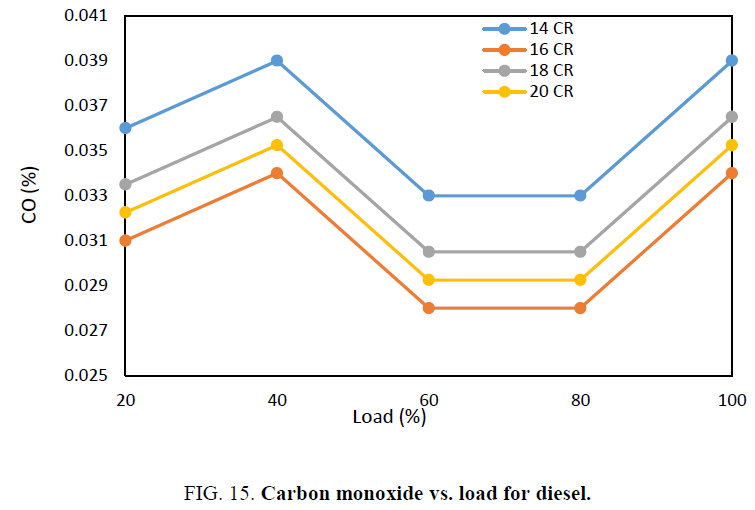 Muralidharan and Vasudevan  investigated performance emission and combustion analysis using waste cooking oil with diesel on a variable compression ratio engine and concluded that longer ignition delay and diminishment in carbon moNOxide emissions. Gumus and Kasifoglu  analyzed the performance and emissions of diesel engine using neat apricot seed kernel oil with diesel blends and found lower concentration of apricot seed kernel oil methyl ester in blends give a better improvement in the engine performance and exhaust emissions. Ramadhas et al. analyzed a diesel engine utilizing elastic seed oil biodiesel blends and found that the lower blends expands the effectiveness of the engine and brings down the fuel utilization contrasted with the higher biodiesel blends. Ilkilic et al. 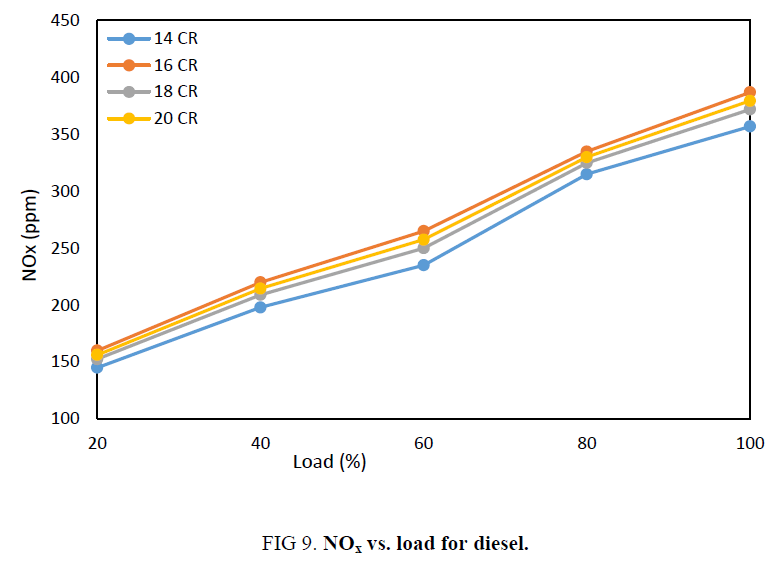 investigated performance and emission characteristics of a single cylinder diesel engine using safflower oil biodiesel blends and found that the CO, smoke and particulate matter emissions were reduced compared to diesel and the NOx and HC emissions were increased. Bari et al. have investigated the use of preheated crude palm oil as fuel and concluded that preheating was essential for the smooth flow of fuel through the injection system. Barsic and Humke  have investigated the use of preheated vegetable oils as fuel for diesel engines and concluded that preheating to 75°C is essential to dissolve the wax and prevent the clogging of fuel filters. Suryanarayana and Prathap  study on performance of a Kirloskar diesel engine with fish oil methyl esters showed no major deviation as an alternate fuel but showed that it has environmental benefits and good combustion properties. Yang et al. study on the performance and combustion characteristics of biodiesel and its blend fuels shows that biodiesel/blend fuels have high break specific fuel consumption of about 42% at 25% engine load and low engine speed. Yamin et al. study on the use of waste oil biodiesel has showed an increase of 4.75% in fuel density compared to pure diesel and also there was a 13.43% decrease in calorific value of fuel and 7.24% for unused oil biodiesel. Hossain and Davies  study on plant oils as fuel for diesel engine showed that raw plant oil when compared to biofuel and fossil diesel has better potential to reduce GHG emissions. Azoumah et al. study showed that for evaluating the optimum load to be supplied to that engine exergy and gas emission analyses is an effective method Bridjesh et al. . Experimental results showed reduction in brake thermal efficiency, nitric oxide and increase in brake specific fuel consumption, carbon moNOxide, hydro carbon with Calophyllum inophyllum biodiesel blends than neat diesel. Mahua oil is gotten from the seeds of Madhuca indica, a deciduous tree which can develop in semi-parched, tropical and sub-tropical regions. It becomes even on rough, sandy, dry shallow soils and endures water logging conditions. Mahua oil was obtained from an oil factory. The oil was sifted to evacuate the pollutions. Diesel fuel was utilized as benchmark fuel. The properties of mahua oil utilized as a part of the present examination are introduced in Table 1. The consistency was resolved at various temperatures utilizing redwood viscometer to discover the impact of temperature on the viscosity of mahua oil. The viscosity of mahua oil was observed to be 9 times higher than that of diesel fuel. The high consistency of mahua oil might be because of its bigger sub-atomic weight contrasted with diesel. The flash point of mahua oil was higher than diesel and thus it is more secure to store. It is seen that the boiling range of mahua oil was not the same as that of diesel. This might be because of the nearness of segments of high breaking point in mahua oil and their poor instability attributes. The comparison of properties of diesel and mahua oil is given below in the Table 1. Table 1: Comparison of properties of diesel and mahua oil. The schematic diagram of the test setup to test the performance of the engine with esterified mahua oil is appeared in Figures 1 and 2. The engine is rigidly fixed to engine bed by fasteners and nuts. A surge tank is altered to the stand and air goes into the surge tank through air channel and goes through an orifice plate. The distinction in water section in two legs of U-tube manometer gives the weight drop crosswise over orifice plate. This weight drop is utilized to ascertain the mass stream rate of air. The dynamometer used here is brake dynamometer. It has a brake drum associated with the crankshaft. A belt runs over the brake drum one end connected to the spring balance and another end to the load carrying plate. The perusing of the spring parity is taken as the net load on the engine (Table 2). Figure 1: Variable compression ratio diesel engine. The experiments are conducted on variable compression diesel engine, where the engine is coupled with eddy current dynamometer for loading. Diesel is blended with mahua oil and with an additive named diethyl ether and the blending takes place at two different proportions for example BD1 (75% diesel, 20% mahua oil, 5% diethyl ether) and BD2 (70% diesel, 20% mahua oil, 10% diethyl ether), likewise the experiment will be conducted at two different blends, and at different compression ratios 14:1, 16:1, 18:1, 20:1. The results are obtained by using standard formulas and graphs are drawn below. The plots for BSFC at various loads at various compression ratios are given in Figures 3-5. Under full load conditions, BSFC for diesel, BD1, BD2 are found to be 0.24 kg/kWh, 0.25 kg/kWh, 0.27 kg/kWh respectively at 14 compression ratio. At 16 compression ratio under full load conditions, BSFC for diesel, BD1, BD2, were found to be 0.33 kg/kWh, 0.22 kg/kWh, 0.20 kg/kWh respectively. Likewise under full load conditions at 18 compression ratio BSFC for diesel BD1, BD2, were 0.285 kg/kWh, 0.17 kg/kWh, 0.13 kg/kWh. At 20 compression ratio under full load conditions, BSFC for diesel, BD1, BD2, were 0.307 kg/kWh, 0.21 kg/kWh and 0.542 kg/kWh. It was also found that least BSFC was recorded for BD2 at 18 compression ratio and highest BSFC was recorded for BD2 at 20 compression ratio. There was 33.33% of reduction in BSFC at compression ratio 14 for BD1 when compared with diesel. There 39.9% of reduction in BSFC at compression ratio 16 for BD2 when compared to diesel. There was 43.3% of increase in BSFC at 18 compression ratio for BD2 when compared to diesel, there was 61% increase in BSFC at 20 compression ratio for BD2 when compared with BD1. The reduction in specific fuel consumption increases in compression ratio is due to appropriate mixing of fuel and air at higher compression ratio. 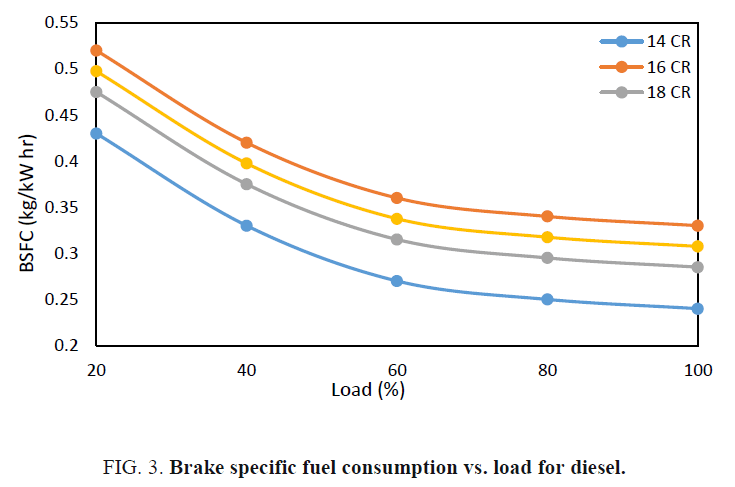 Figure 3: Brake specific fuel consumption vs. load for diesel. 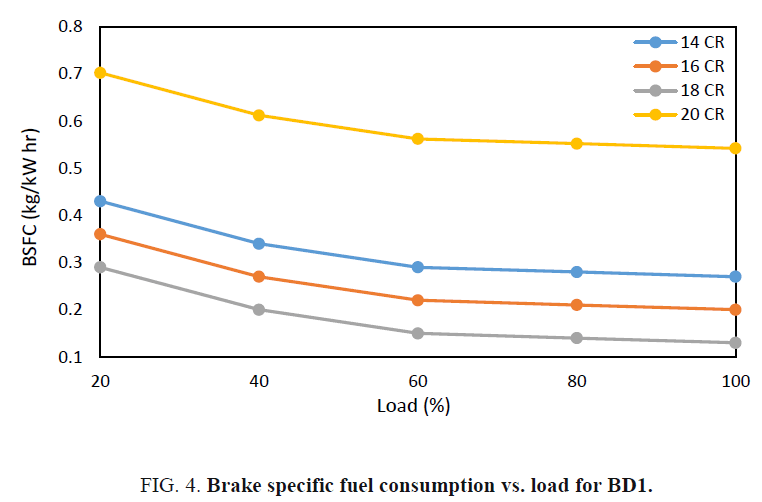 Figure 4: Brake specific fuel consumption vs. load for BD1. 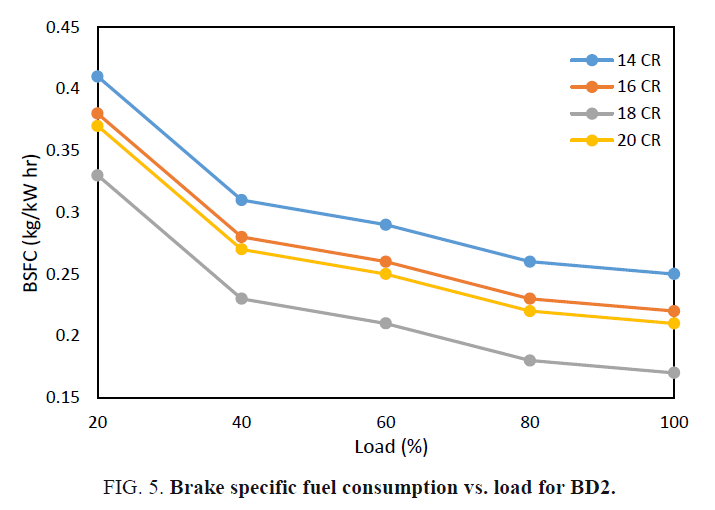 Figure 5: Brake specific fuel consumption vs. load for BD2. The BTE for various loads at various compression ratios are given below in the Figures 5-7. Under full load conditions BTE for diesel, BD1, BD2, were found to be 29%, 35%, 34% respectively at 14 compression ratio. At 16 compressions ratio under full load conditions the BTE for diesel, BD1, BD2 were found to be 31%, 37%, 33%, respectively. Similarly under full load conditions at 18 compression ratios the BTE for diesel BD1, BD2 were 30%, 38%, 32%. At 20 compression ratio the BTE for diesel, BD1, BD2, were found to be 32%, 39%, 37%. The least BTE was recorded for diesel at 14 compression ratio and the highest was recorded for BD1 at 20 compression ratios (Figure 8). There was 17.14% increment in BTE at 14 compression ratio for BD1 when compared to diesel and it was found that there was 14.7% increment in BTE at 14 compression ratio for BD2 when compared to diesel. There was 16% increment in BTE at 16 compression ratio for BD1 when compared to diesel, and there was a 10.8% decrement of BTE for BD2 when compared to BD1, there was 21.0% of increment in BTE at 18 compression ratio for BD1 when compared to diesel, we can conclude from graphs that the higher BTE has been achieved with BD1 as a fuel. This increase in brake thermal efficiency at higher compression ratio is due to proper atomization and vaporization of air fuel mixture. 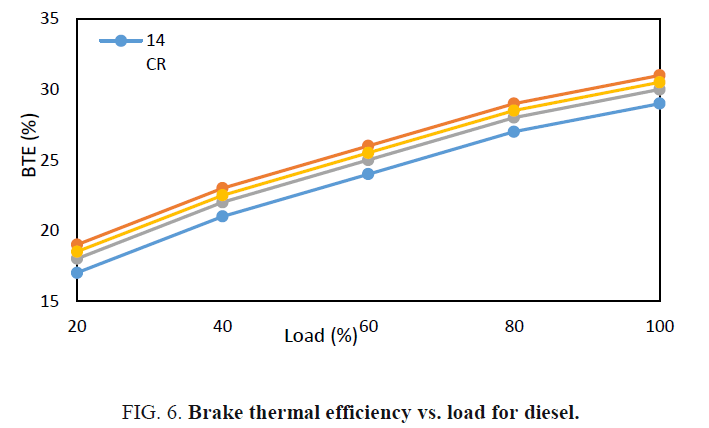 Figure 6: Brake thermal efficiency vs. load for diesel. 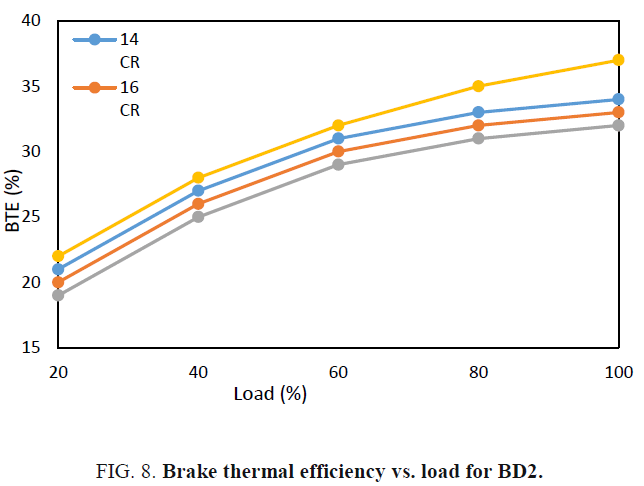 Figure 7: Brake thermal efficiency vs. load for BD1. 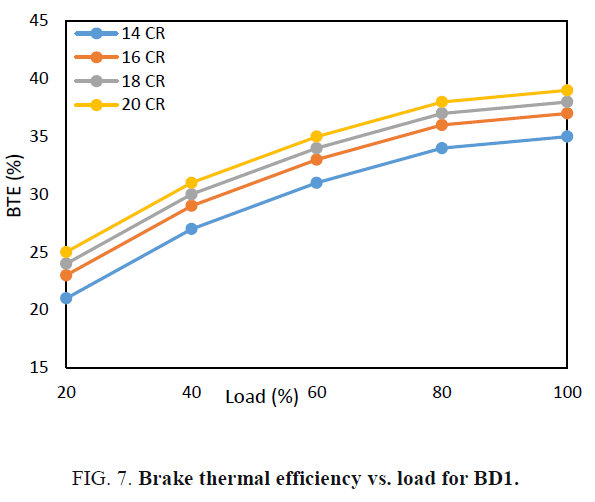 Figure 8: Brake thermal efficiency vs. load for BD2. The plots for NOx at various loads at various compression ratios are given below in the Figures 9-11. Under full load conditions NOx emissions for diesel, BD1, BD2, were found to be 357 ppm, 362 ppm, 377 ppm at 14 compression ratio respectively. At 16 compression ratio under full load conditions the NOx emissions were found to be 387 ppm, 367 ppm, 390 ppm. Likewise at 18 compression ratios under full load conditions the NOx emissions were found to be 372 ppm, 377 ppm, and 403 ppm respectively. At 20 compression ratio under full load conditions the NOx emissions were found to be 380 ppm, 387 ppm, 426 ppm. It was found that least NOx emissions were found at 14 compression ratio for neat diesel, and the highest NOx emissions were found at 20 compression ratio for BD2. There was 0.01% increase in NOx emissions under full load conditions at 14 compression ratio for BD1 when compared to diesel, There was 0.03% of increase in NOx emissions under full load conditions at 14 compression ratio for BD1 when compared to BD2, from graphs below we can conclude there was 0.05% of decrement in NOx emissions under full load conditions at 16 compression ratio for BD1 when compared to diesel. There was 0.065% increment in NOx emissions under full load conditions at 16 compression ratio for BD2 when compared to BD1. The reason for peak combustion temperature increased accordingly due to higher amount of heat release. FIG 9: NOx vs. load for diesel. 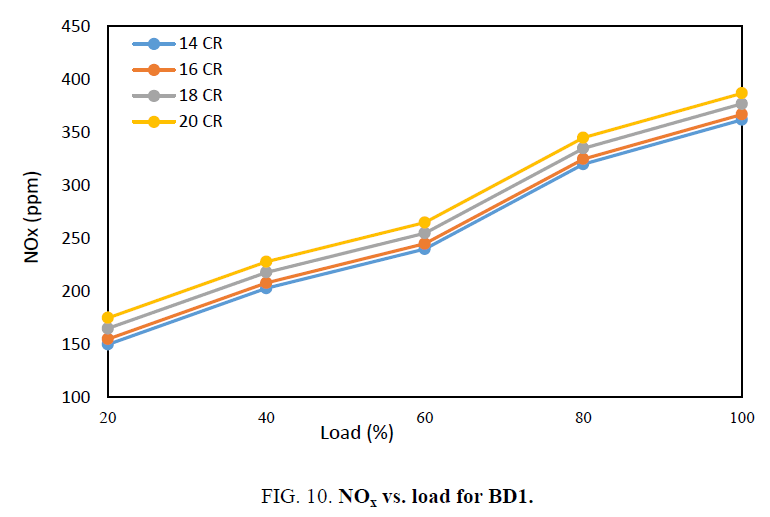 Figure 10: NOx vs. load for BD1. 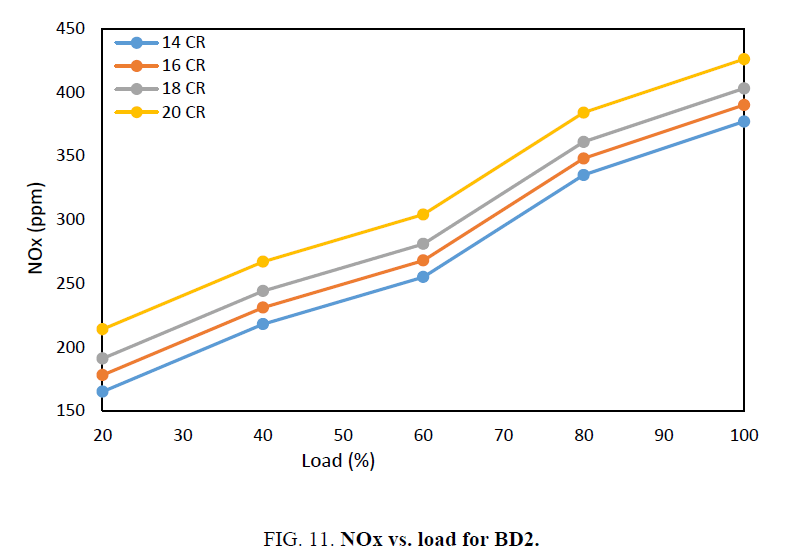 Figure 11: NOx vs. load for BD2. The plots for HC emissions at various loads at various compression ratios are given in the Figures 12-14. Under full load conditions HC emissions for diesel, BD1, BD2, were found to be same i.e., 23 ppm at 14 compression ratio. At 16 compression ratio under full load conditions the HC emissions were found to be 21 ppm, 24 ppm, 21 ppm. Under full load conditions at 18 compression ratio the HC emissions were found to be 22 ppm, 22 ppm, 19 ppm, at 20 compression ratio under full load conditions the HC emissions were found to be 22 ppm, 20 ppm, 25 ppm. Under full load conditions the highest values of HC emissions were recorded at 20 compression ratio for BD2 and the least values of HC emissions were recorded at 18 compression ratio for BD2 itself. At 14 compression ratio it was found that the emissions were constant for diesel, BD1 and BD2. At 16 compression ratio there was 0.125% of increase in HC emissions for BD1 when compared to diesel, At 16 compression ratio there was 0.083% decrease in HC emissions for BD2 when compared to BD1. At 18 compression ratio there were similar emissions for diesel and BD1, whereas it was found that there was 0.136% of decrease in HC emissions for BD2 when compared to diesel and BD1. 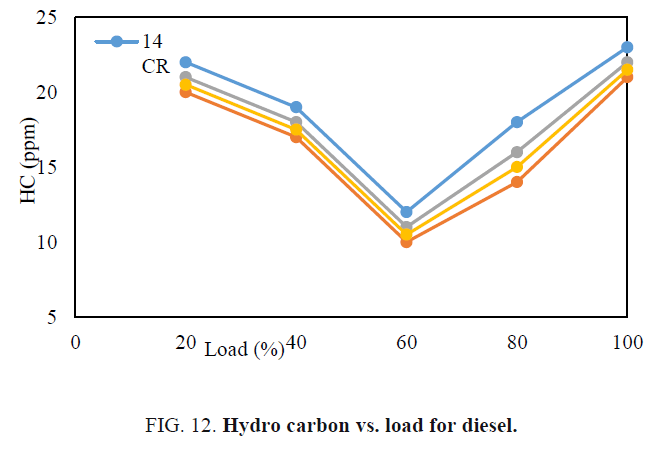 Figure 12: Hydro carbon vs. load for diesel. 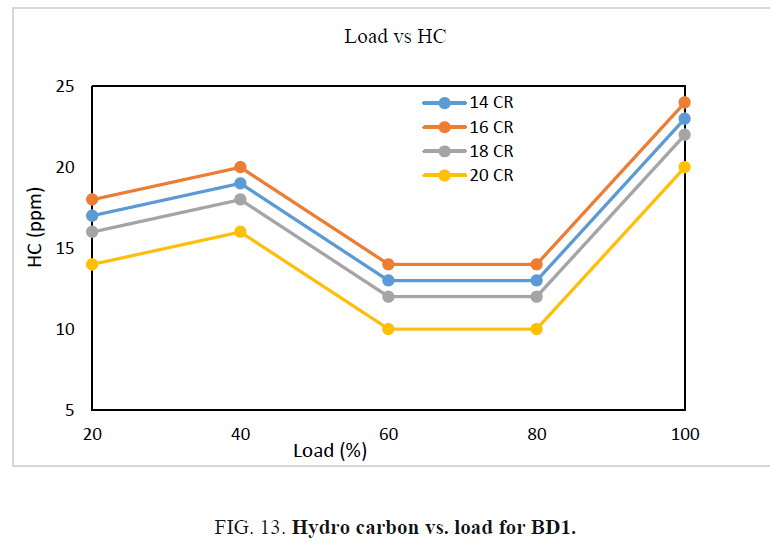 Figure 13: Hydro carbon vs. load for BD1. 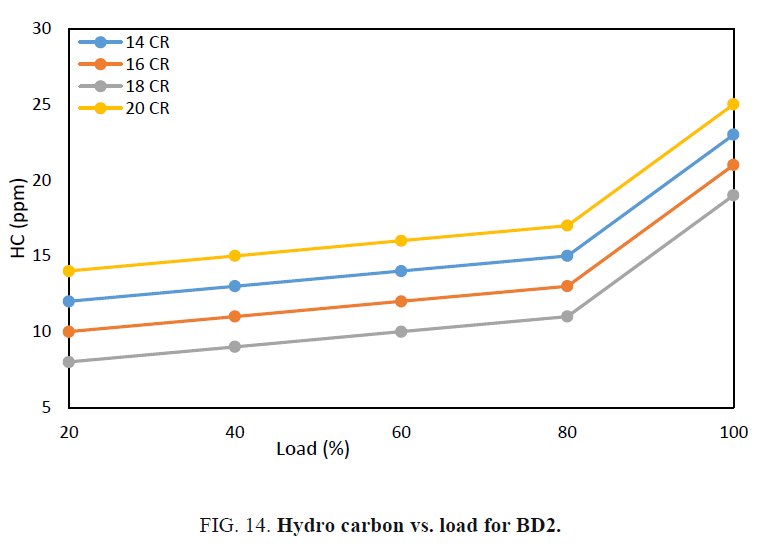 Figure 14: Hydro carbon vs. load for BD2. The plots for CO emissions at various loads at various compression ratios are given below in the Figures 15-17. Under full load conditions CO emissions for diesel, BD1, BD2, were found to 0.039%, 0.069% and 0.061% respectively at 14 compression ratio. At 16 compression ratio under full load conditions the CO emissions were found to be 0.034%, 0.06%, 0.084%. Under full load conditions at 18 compression ratio the CO emissions were found to be0.0365, 0.029%, 0.0107%, At 20 compression ratio under full load conditions the CO emissions were found to be 0.03525%, 0.052%, 0.13%. Under full load conditions the highest values of CO emissions were recorded at 20 compression ratio for BD2 and the least values of CO emissions were recorded at 16 compression ratio for BD1. At 14 compression ratio it was found there was 0.434% of increase in CO emissions for BD1 when compared to diesel. At 16 compression ratio there was 0.82% of decrease in CO emissions for BD1 when compared to diesel, At 16 compression ratio there was 0.092% increase in CO emissions for BD2 when compared to BD1. At 18 compression ratio there was 0.205% of decrease in CO emissions of CO for diesel and BD1, whereas it was found that there was 0.107% of decrease in CO emissions for BD2 when compared to diesel and BD1. At 20 compression ratio it was found that 0.89% of decrease in CO emissions for BD1 when compared to diesel. The variation in CO emissions at lower compression ratio may be due to more dilution of fresh air with residual gases, and also due to poor mixing of fuel and air. Figure 15: Carbon monoxide vs. load for diesel. 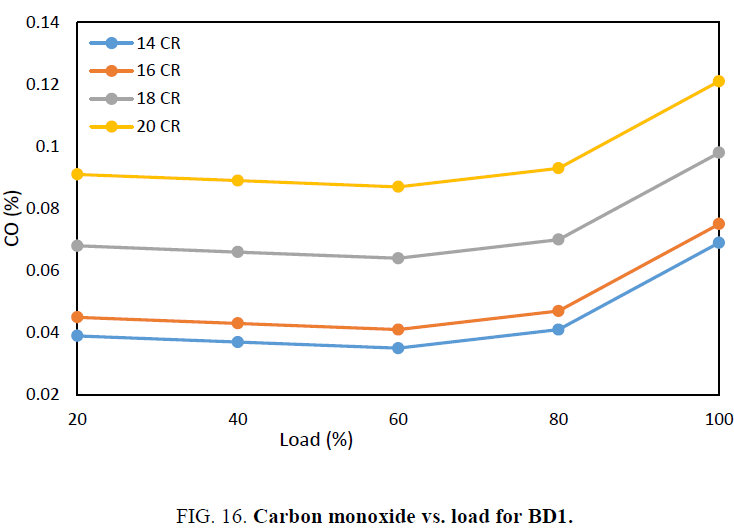 Figure 16: Carbon monoxide vs. load for BD1. 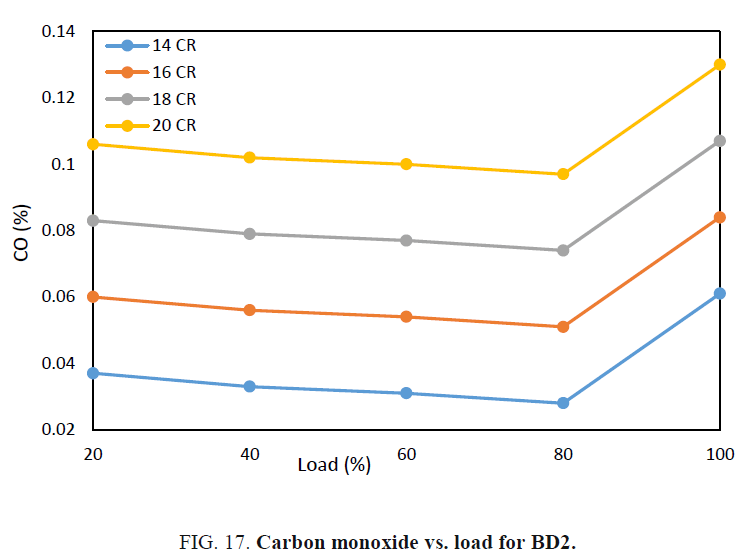 Figure 17: Carbon monoxide vs. load for BD2. Smooth working of engine is observed with mahua oil by blending with diesel without any modifications. Percentage increase in esterified mahua oil increases the viscosity of diesel. Increase in percentage of mahua oil increases the cetane number of the blend. Slight increase in brake thermal efficiency and decrease in specific fuel consumption is observed in the case of esterified mahua oil compared to that of diesel. 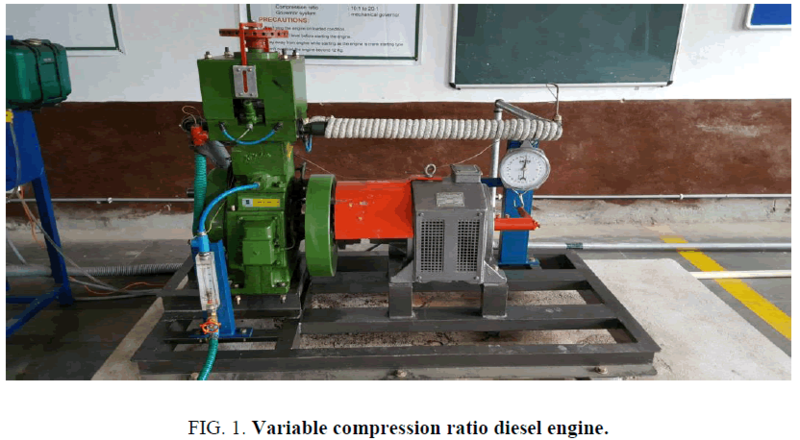 Muralidharan K, Vasudevan D. Performance, emission and combustion characteristics of a variable compression ratio engine using methyl esters of waste cooking oil and diesel blends. App Energy. 2011;88:3959-68. Gumus M, Kasifoglu S. Performance and emission evaluation of a compression ignition engine using a biodiesel (apricot seed kernel oil methyl ester) and its blends with diesel fuel. Biomass Bioenergy. 2010;34:134-9. Ramadhas A, Muraleedharan S, Jayaraj CS. Performance and emission evaluation of a diesel engine fueled with methyl esters of rubber seed oil. Renewable Energy. 2005;30:1789-800. Ilkilic C. Ayd?n S, Behcet R, et al. Biodiesel from safflower oil and its application in a diesel engine. Fuel Processing Technology. 2011;92:356-62. Bari S, Lim TH, Yu CW. Effect of preheating crude palm oil on injection system performance and emissions of a diesel engine. Renew Energy. 2002;77:339-51. Barsic NJ, Humke AL. Performance and emissions characteristics of a naturally aspirated diesel engine with vegetable oil fuels. SAE, 1981;810262:1173-87. Suryanarayana MC, Prathap RR. Performance and emission characteristics of a Kirloskar HA394 diesel engine operated on fish oil methyl esters. Renewable Energy. 2010;35:355-9. An H, Yang WM, Maghbouli A, et al. Performance, combustion and emission characteristics of biodiesel derived from waste cooking oils. App Energy. 2013;112:493-9. Yamin JA, Sakhnini N, Sakhrieh A, et al. Environmental and performance study of a 4-stroke ci engine powered with waste oil biodiesel. Sustainable Cities and Society. 2013;9:32-8. Hossain AK, Davies PA. Plant oils as fuels for compression ignition engines: A technical review and life-cycle analysis. Renewable Energy. 2010;35:1-13. Azoumah Y, Blin J, Daho T. Exergy efficiency applied for the performance optimization of a direct injection compression ignition (CI) engine using biofuels. Renewable Energy. 2009;34:1494-500. Bridjesh P, Prabhu Kishore N, Mallikarjuna MV, et al. Performance analysis of variable compression ratio diesel engine using Calophyllum inophyllum biodiesel. Ind J Sci and Technol. 2016;9.